Yes, you read that right. I shot a gun. It was my first time. And, it was crazy. I was completely overwhelmed with the intensity of the situation. Having never really been around guns growing up, and knowing they are a deadly weapon, I was faced with a plethora of emotions that day. My husband, on the other hand, couldn’t wait. He was like a kid in a candy shop. He has been around guns his whole life. His grandfather and uncle taught him how to shoot when he was 8 years old. He’s been a hunter, outdoors kind of guy ever since. A point we argue about profusely when it comes to taking our kids out shooting. On one hand, I don’t want them to experience the same fear I had as a thirty-something holding a gun for the first time, on the other, I want the fear of God in them when considering holding or even looking at a gun. It is a tough compromise, but an important one for us to agree on. 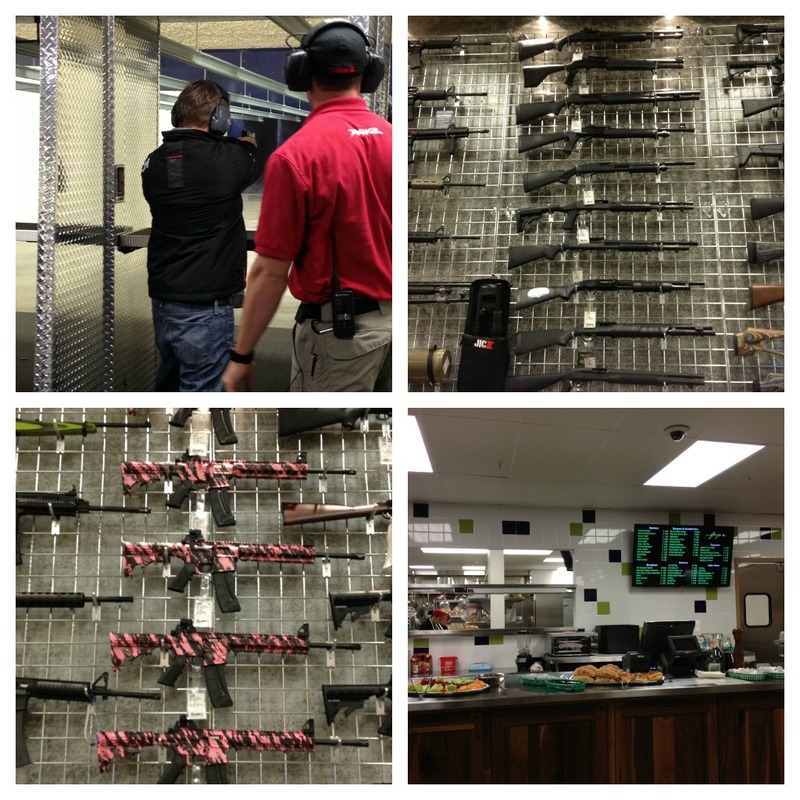 The Range 702 opened a few weeks ago along the industrial corridor, off of Dean Martin. Coincidentally, my husband had just brought up this new wave of high-end gun ranges opening up along the Strip. This is huge for him. As someone who enjoys shooting, and appreciates the mechanical beauty of these weapons, he was quite intrigued by the trend of facilities entering into the main stream and allowing people the opportunity to shoot. You may or may not have noticed the spike in gun sales in the last few years due to many reasons: violence, government, politics, economy- for whatever reason, the American people are beginning to take an interest again in the Second Amendment of the Constitution, exercising their right to bare arms. The nice thing about these gun ranges popping up is that it provides the learnings for proper usage to an average citizen, like me, who is in the beginning stages of operating and handling a piece. It also provides a safe space for those at any level to engage in conversation about new mechanics, safety precautions, and education. I was quite impressed with The Range 702. 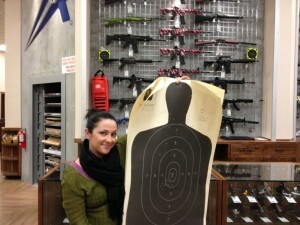 It was my first official gun range, so I don’t have much to compare it to. My husband is my expert for this article, and was also quite impressed for several reasons: 25 shooting lanes, the size of the facility (45,000 square feet), and the gun and retail selection. You can also grab some grub at Gary’s Cafe, which features a full menu from breakfast to lunch and dinner options. There is also a swanky VIP room where a group of up to 20 can enjoy the comfortable surroundings of leather couches and chairs, a pool table, flat screen TVs and a full service bar area. The VIP room also has a range with 7 lanes set aside for personal use. A second room provides space for public safety and self defense classes, which are available to the public. Additionally, other classes are offered at The Range 702, such as State of Nevada Concealed Firearms Permit (CCW), Multiple NRA courses, Basic thru Advanced Defensive Pistol, Variety of Women’s Classes and Hunter’s Safety. Of course, The Range 702 offers a complete retail shop filled with all styles and options of guns, ammunition, as well as safes and other merchandise. Not only is The Range 702 convenient for locals, but also to those visiting the Las Vegas Stip. It offers a different dynamic for something to do other than play in the large resorts and casinos, while still reminding you that you haven’t left the West- it’s just a little less Wild…or is it? Yes. I shot a gun. I shot two, in fact, an M-16 rifle and a Glock 9mm. Once I got past the emotional stress of holding and shooting a weapon that can kill, I also started to realize how empowering, with the right education and knowledge, using a weapon like this can be, especially for women. When given the chance to shoot the rifle, I also began to understand how my husband enjoys shooting for sport. The challenge of finding the target, holding the rifle, and aiming properly to ensure a perfect shot is really quite exhilirating. This experience opened my eyes to a whole new level of respect for gun owners. The gun range is open to young adults starting at ages 12 and up. Check the website for specials and fees. As of 10/30/12, rental rates are $10, and locals can enjoy a special rate of $5. If you are interested in booking the VIP suite, be sure to call ahead to book with plenty of notice. For the months of November and December (2012), The Range 702 will donate 10% of their retail proceeds to the non-profit organization, Candlelighters Childhood Cancer Foundation of Nevada. You can also follow The Range 702 on Facebook and Twitter. I was an invited guest of the media to experience The Range 702. All thoughts and opinions are 100% my own. Yikes! I don’t know if I’d have the guts to do that! Both my dad and husband have offered to teach me, but I’ve always been pretty freaked out by it. Good for you for doing it! YES! I recently went for the first time and was absolutely not prepared for the full-body adrenaline rush and then relief. You told it well! I grew up around guns, and shot them when I was a kid, so to me, they’ve always been a part of my life. We used to go “shooting” with our dad. I love that you shared such a different sort of Vegas attraction on your blog! HA! Who *knew* there would be pink camo rifles.